I love salmon. It’s such a versatile fish and is really mild. It’s a lot like chicken – you can really add basically any flavors to it and it will still be delicious. This recipe made the salmon crunchy and the paprika gave it a nice spice. I actually used a four-cheese mashed potato mix which added positively to the flavor as well. Prep: 10 minutes. Cook: 6 minutes. 4 servings. Cut fish into 4 serving pieces. Beat egg and water with fork. Mix potato mix, cornstarch, paprika, and lemon pepper. Dip just the top and sides of fish into the egg, then press into potato mixture. Heat oil in 10-inch skillet over medium high heat. Cook fish, potato sides down in oil 3 minutes. Carefully turn fish with wide slotted spatula. Reduce heat to medium. Cook about 3 minutes longer or until fish flakes easily with a fork. If fish has skin, carefully slide cooked fish off of the skin with wide spatula. Salmon really versatile!!! YUM YUM! I put paprika in almost everything! 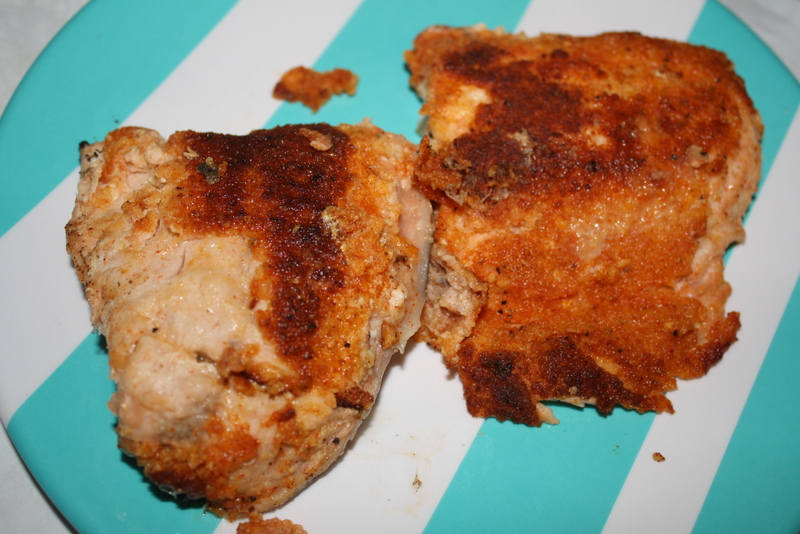 What an interesting idea – the salmon looks crunchy and nicely browned on the outside! Thank you! It was really tasty. That does look really good, and it reminds me how my Mom used to make fish but I don’t think I have ever tried making it….. now I have to try it! I especially love the paprika! I hope you like it! It was a big hit at my house!